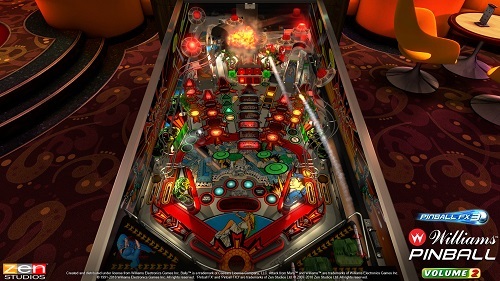 For many years, Zen Studios has been making original video pinball tables for their Pinball FX and Zen Pinball outlets. Now for the first time, they’re tackling real life classic pinball machines in video form from the Williams lineup. Volume 2 of this set includes three more tables. To play them, first you need to download the Pinball FX3 hub (available for most current consoles and PC, but reviewed on PS4 here). And then you can buy and download table sets. The Williams tables are handled a bit differently than the other Zen Studios’ originals. First, you can play with either the Pinball FX3 table upgrade system or the original specs from the arcade. And with a push of a button, you can switch visuals to make the tables look like the other Zen Studios tables with extra graphics, or the original way the tables looked in real life. Also when you start a game, you get a full view of the machine with facts and history on each one. In a way, I like this setup and gameplay better than the Zen original tables. Really the only problem I have with Volume 2 is the tables aren’t as recognizable to me. Volume One had The Getaway 2 and Medieval Madness, two tables I remember very well and still see in arcades! I don’t know how I missed reviewing that set! Oh well. Volume 2 only has one table I remember, Attack From Mars. I think that must’ve been a pretty popular one since it also got a sequel and remake. One cool thing is that you get a table for free: Fish Tales, which of course has a fishing theme. The tables on Volume 2 include Black Rose, which has a pirate theme. The neat thing about this table is that there is a cannon below the field where you can aim and shoot pinballs from. I don’t know how I can describe The Party Zone. It’s weird but also colorful and entertaining, at least. And last is the aforementioned Attack From Mars, which has a cheesy B-Movie sci-fi UFO motif. I can’t wait to see what other tables they remake in future volumes. I’d love to see a Pinbot collection with all three in the series, or Cirqus Voltaire, my all-time favorite pinball machine. All Pinball FX3 tables are rated E-10 with ESRB descriptors of Fantasy Violence and Mild Language. Nothing really objectionable on these tables that I could see. Reading skill is helpful for some of the menus, but not necessary just to play. Just pure, simple fun.